ATTLEBORO, Mass. – When Attleboro loaded the bases in the fifth inning, Taunton head coach Blair Bourque decided to make a call to the bullpen to try and keep the score even. The decision to bring in senior right-hander Brendan Bignar proved fruitful as he struck out the next two batters to escape the jam. 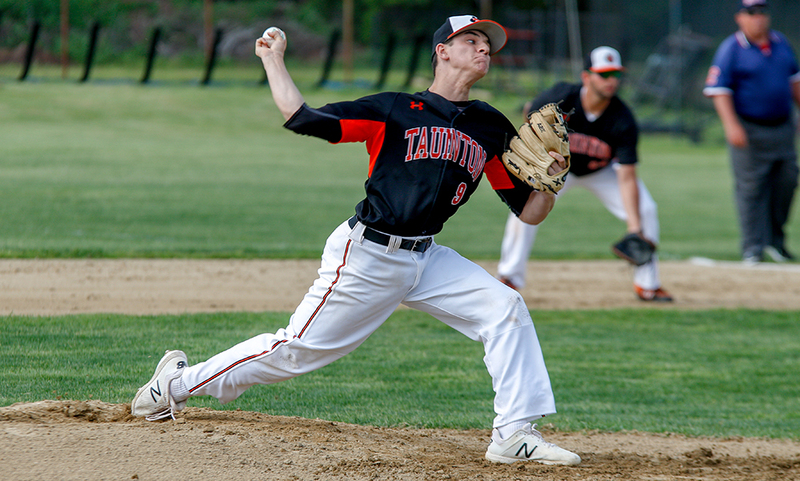 Along with Bignar, Taunton’s starter Josh Lajoie had success silencing the Bombardiers’ bats en route to a 1-0 victory. Lajoie pitched 5.1 innings, striking out 12 batters while allowing just one hit. The two combined to toss a seven-inning shutout, combining for 18 total strikeouts. As effective as Taunton’s pitching staff was, Attleboro’s starter and senior captain Jon Candiales was just as brilliant. The right-hander struck out seven batters while pitching all seven innings for the Bombardiers’, allowing just two hits and one run. Taunton’s eventual game-winning run came in the top of the sixth, when Trevor Pietrzyk was able to score after Attleboro tried to throw out Tyler Medeiros stealing second. Pietrzyk started the inning with a leadoff single and was able to steal second to be put in scoring position. He moved to third after a sacrifice bunt from Bignar. Attleboro had plenty of opportunities throughout the game to put runs on the board, but failed to capitalize. The Bombardiers’ drew eight walks, led by Tim Callahan with three, which is something Taunton has struggled with all season. Attleboro’s best opportunity outside of their bases-loaded situation in the fifth came the inning earlier. After Sam Larkin was hit by a pitch and Dakota Kirby drew a walk, a double steal put both runners in scoring position with no outs. But three strong stops by Taunton catcher Ben Joyce left the runners where they were and Lajoie recorded three consecutive strikeouts to end the Bombardiers’ threat. “We’ll take that, we’ll take it anyway them come right now, that was a tough game,” Bourque said. Taunton baseball (8-5 Hockomock, 11-5 overall) returns to the diamond on Friday for a matchup with Sharon. Attleboro (5-9 Hockomock, 6-10 overall) is back in action on Sunday, as they welcome Lowell to town. ATTLEBORO, Mass. 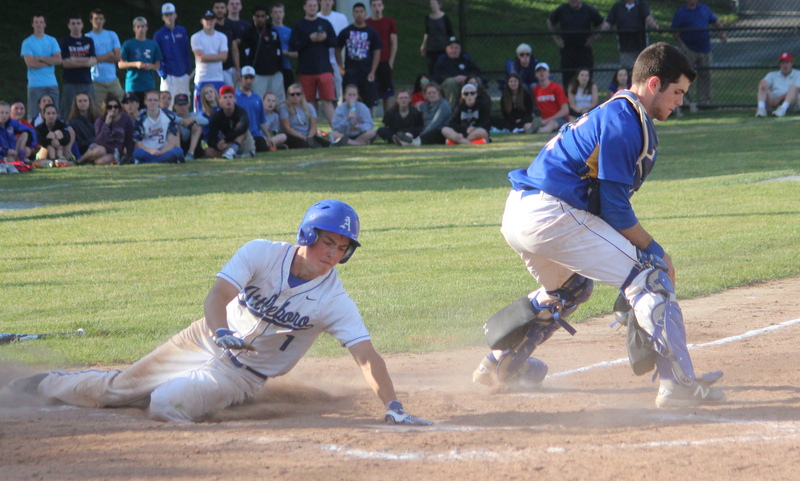 – Despite struggling to generate offense for the majority of the game, Attleboro delivered in two key moments to capture a 2-1 win in walk-off fashion over Brookline in the D1 South quarterfinal on Monday. After surrendering the game’s first run to the Warriors in the top of the fourth, the Bombardiers answered with a run in the bottom half of the inning. With the score tied 1-1 in the bottom of the seventh, senior Nolan Kane was called upon as a pinch hitter and drove a ball to deep center field that sailed over the defense and allowed the winning run to score from third. Attleboro sophomore designated hitter Dakota Kirby led off the seventh inning with a double to right center field. Third baseman Robbie Araujo then grounded back to the pitcher, moving Kirby to third on the fielder’s choice. Kane then pinch hit, and after fouling off a number of pitches, delivered the game-winning hit. Trailing 1-0 in the bottom of the fourth, Jon Dunn reached on an error for Attleboro’s first base runner of the game off of Brookline freshman pitcher Josh Richardson. With Tyler Stowe at the plate, Dunn faked as if he was going to steal, forcing the second baseman to cover the bag and allowing Stowe’s grounder to the right side to sneak through for a single. Nate Tellier then lined a single up the middle, scoring Dunn from second and tying the game. Attleboro junior pitcher Tyler McGovern went the distance for the win, allowing just one run on eight hits with seven strikeouts. Three singles in the fourth inning accounted for the only Brookline run, with Mitchell Schroeder driving in Reo Shimbori. A second runner attempted to score on the play, but Attleboro catcher Will Carter applied a tag at the plate to keep it a one run deficit. Richardson retired the first nine batters he faced in the game and missed the zone with only three pitches in doing so. After Attleboro’s run in the fourth, he again set down nine of the next ten Bombardiers before the walk-off hit in the seventh inning. While only striking out two, Richardson allowed just five hits and one earned run, and his command of the strike zone early in the game led to his success. After two one-run wins to begin the D1 South Sectional tournament, Attleboro baseball will now face #1 Silver Lake in the semifinal round on a date and time to be announced as of publishing. Attleboro’s schedule will be updated as soon as a date, time and location are announced. NORWOOD, Mass. 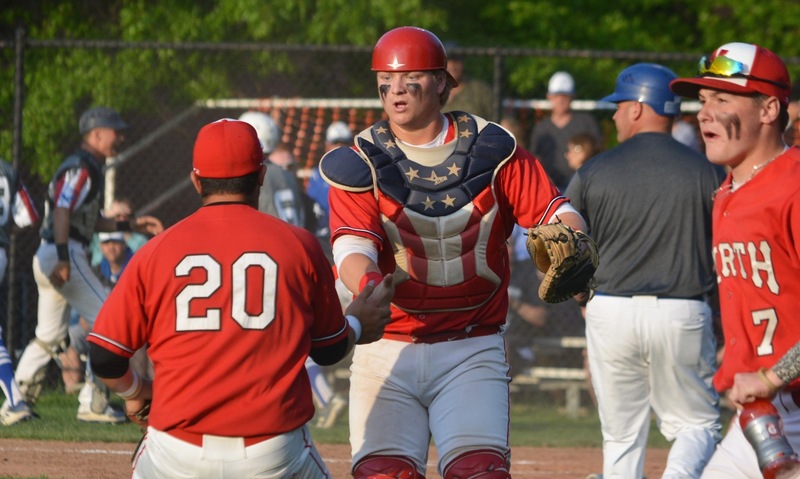 – Norwood senior left handed pitcher and Bay State Conference Herget Division MVP Sean Mellen was at the top of his game on Thursday afternoon as the fifth seeded Mustangs hosted #12 Attleboro. But Attleboro senior righty Nate Tellier was better. Tellier out-dueled the Northeastern-commit, tossing a complete game shutout and scored the game’s only run in the top of the ninth inning as the Bombardiers scored a 1-0 upset win over Norwood in nine innings. The Bombardiers threatened with a pair of hits in the top of the first inning, but it wasn’t until the top of the ninth when they finally got another hit. Tellier hit a one out dribbler up the third base line, forcing a high throw and allowing the senior to advance to second. He then stole third, his fourth stolen base of the game. After Will Carter was hit by a pitch to put runners on the corners, sophomore Dakota Kirby made contact with the third pitch he saw. Tellier took off from third, sprinting down the line as Mellen came off the mound and looked to field the ball. Tellier slid around the catcher, slapping his left hand down onto the plate well before a tag attempt to give the Bombardiers a 1-0 lead. “If it was hard contact, I wasn’t going to go, but I just read it and I hoped for the best,” Tellier said. The senior came back out to pitch the bottom of the ninth, noting that there was no chance he was going to come out of the game at that point. Tellier recorded two straight outs — a ground out back to the mound and his 11th strikeout of the game — before allowing just the third Norwood hit of the game. The game ended with Tellier inducing a grounder to third, where Robbie Araujo for the final out. Araujo recorded his fifth assist with the final out, with Tellier noting “I trust him with my life” to get the out. Jon Dunn led of the game for Attleboro with a single up the middle and moved to second on a sacrifice bunt from Tyler Stowe. Tellier singled to put runners on the corners. Dunn got caught in a run down between third and home on an infield hit and Tellier moved to third. Mellen got out of the inning with his first of 13 strikeouts. Tellier kept Norwood hitless for the first five innings, only allowing three base runners (two walks, hit by pitch). Norwood’s first hit came with two outs in the sixth when Michael James found space through the right side. A stolen base, wild pitch and a walk put runners on the corner but once again, Tellier induced a weak grounder and Araujo charged, making a perfect throw to first to get the out. Norwood threatened again in the bottom of the seventh behind a lead off single and a sacrifice bunt. But Tellier wasn’t bothered, getting a ground out to Araujo at third and then getting his ninth strikeout of the game to escape the inning. ‘It turned out well’ is a vast understatement by the modest Tellier, who has allowed just three earned runs through 44 innings this season. Tellier pitched a no-hitter against North Attleboro in an eight innings on Monday. He now has 27 strikeouts in his last two starts and 24 straight scoreless innings. It was a little bit of revenge for the Bombardiers, who were upset two years ago as the two seed by the Mustangs,in the D1 South Semifinals in a 14 inning thriller. Tellier played in that game and Stowe pitched 11 shutout innings in the game. Other seniors were involved, watching from the dugout at Adams Field in Quincy. It was certainly on the minds of the players and coaches today. Attleboro baseball, as a 12 seed, will now host its next game after #13 Brookline upset #4 Taunton in extra innings. The Bombardiers will host the Warriors on Monday at 4:00. BROCKTON, Mass. – Just win one game at a time. That’s what the mindset of the Mansfield baseball team has been this past week while holding a slim chance of earning a ticket to the tournament. 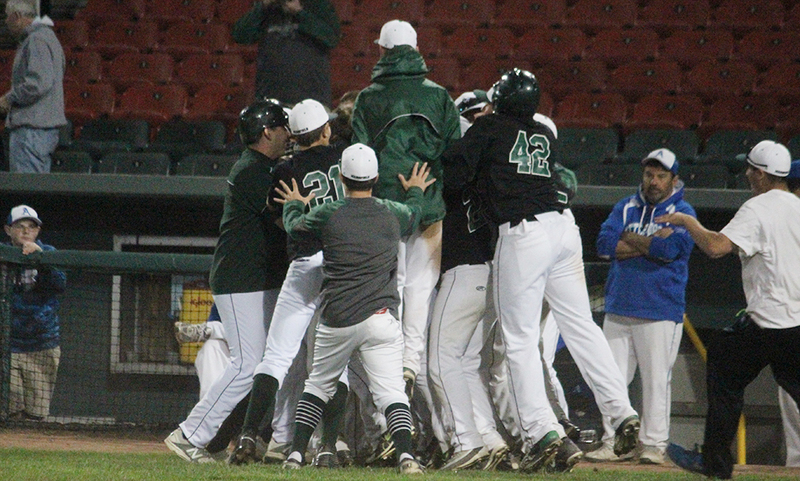 So far, the mindset has paid dividends as the Hornets have knocked off two straight wins including Wednesday night’s 2-1 walk-off victory against Attleboro at Campanelli Stadium. With the score tied at 1-1 heading into the bottom of the seventh, it certainly appeared as if the Bombardiers and Hornets were heading to extra innings. 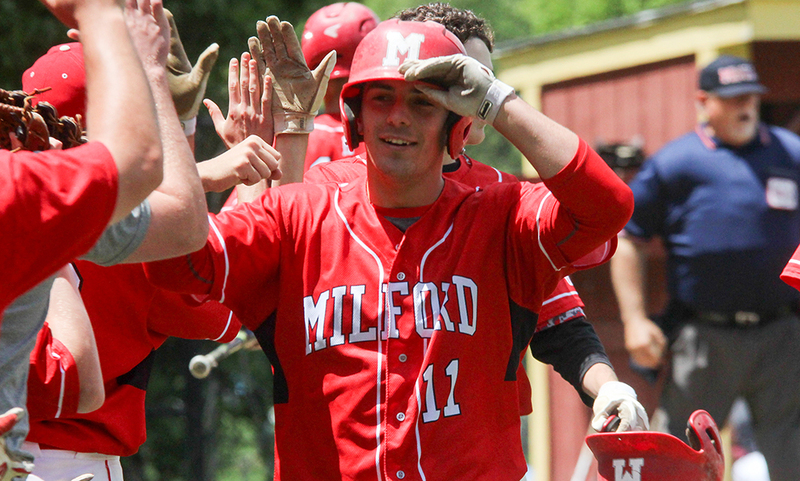 However, it took just two batters for the outcome to result in Mansfield’s favor. Junior shortstop Max Boen drew a leadoff walk and decided to risk the Hornets’ fate with a stolen base. The risk was well-worth the reward as Boen beat out the force attempt at second. Two pitches later, junior centerfielder Zach Peterson dropped down a bunt in front of the mound with Boen in motion. On Tyler McGovern’s throw to first, Boen decided again to risk things and dash towards home. Bombardier first baseman Nate Tellier threw it to catcher Dakota Kirby, but Boen got in on time for the game-winning run and was swarmed by his Mansfield teammates. In addition to delivering the walk-off bunt, Peterson scored the game’s opening run in the bottom of the first for the Hornets. Peterson reached base on a leadoff single to left field, wound up on second on a sacrifice bunt off Aidan Cahill’s bat, and eventually came around to score on a fielder’s choice. Hits were hard to come by in a pitchers’ duel that offered two of the best pitchers in the Hockomock in the form of Attleboro’s Tyler McGovern and Mansfield’s Tyler Dalton. Both starters tossed complete games for their respective teams. After giving up the run in the first, McGovern found his rhythm and allowed the Hornets to reach third base just once until the final inning. The right-hander retired the side in the second and sixth innings on his way to allowing four hits while striking out two. Stymied by Dalton and not successfully placing a runner on base through the first three innings, Attleboro started the fourth inning with three consecutive singles. Jon Dunn and Tyler Stowe stroked singles to left field to put two runners on base, and then converted a double-steal putting runners on second and third with no outs. Dunn came across and tied the score at one on a Tellier single to right. Dalton, who has been labeled as the Hornets’ “ace” this season, retired the side in the first, second, third, and seventh innings. The sophomore struck out five while issuing no walks on six hits. Dalton was backed up by a strong Mansfield defense which killed several Attleboro threats. In the second inning, Kirby drilled a liner into the right field corner, but was gunned down at second by Jake Tryder. With an opportunity to take the lead in the fourth, as there were runners on second and third, Matt Callahan was robbed by a leaping Tyrone Pascual. In the fifth, the Hornets turned a double play started by Boen at short to erase a leadoff single. Mansfield (6-9 in league-play, 7-10 overall) looks to carry over their one-day-at-a-time momentum when they travel to take on Lynn Classical on Thursday night. Attleboro (7-7 in league-play, 7-9 overall) looks to get back into the win column on Friday when they travel to Dartmouth.